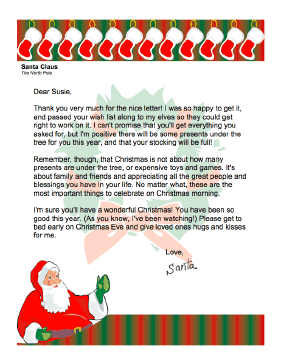 This printable letter from Santa Claus assures a child that even though they may not get everything they wished for, that there are sure to be gifts under the Christmas Tree and a full stocking as well. Thank you very much for the nice letter! I was so happy to get it, and passed your wish list along to my elves so they could get right to work on it. I can't promise that you'll get everything you asked for, but I'm positive there will be some presents under the tree for you this year, and that your stocking will be full! Remember, though, that Christmas is not about how many presents are under the tree, or expensive toys and games. It's about family and friends and appreciating all the great people and blessings you have in your life. No matter what, these are the most important things to celebrate on Christmas morning. I'm sure you'll have a wonderful Christmas! You have been so good this year. (As you know, I've been watching!) Please get to bed early on Christmas Eve and give loved ones hugs and kisses for me.